In this issue: celebrate a master, save the Star Kingdom, and defend the Earth from interstellar attackers. All that plus our September contest winner. Powerful forces in the young Star Kingdom of Manticore’s Parliament are fomenting for the dissolution of the Royal Manticoran Navy. But the universe can be a far more dangerous place than they think, and they’re about to find out why they need the RMN . . . and how very fortunate they are that a young lieutenant named Travis Long is in it. Get A Call to Arms here. Caine Riordan has come through fire unfazed. Now, on a diplomatic mission to the very alien worlds of the Slaasriithi, Caine must shepherd a crucial alliance for the fledgling Consolidated Terran Republic. But Caine isn’t the only one journeying into the unknown reaches of Slaasriithi space. A renegade group with the intention to destroy humanity’s hopes for a quick alliance is on his trail. Caine Riordan must once again step into the fire. In Raising Caine, reluctant interstellar diplomat Caine Riordan must use his skills as a negotiator to keep the Earth from getting destroyed. We wondered how our readers would fare in a similar circumstance. In one short paragraph, craft a defense of humanity and the Earth to keep aliens from destroying us. 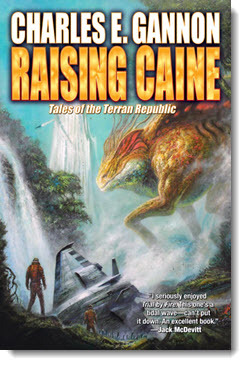 The winner will not only have the satisfaction of knowing he or she saved us all from annihilation, but will also receive a signed copy of Raising Caine. 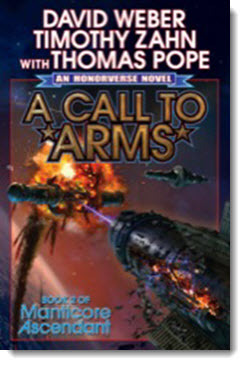 Coming soon to the Baen Free Radio Hour: David Weber, Timothy Zahn, and Thomas Pope discuss their second book in the Manticore Ascendant early Honorverse series, A Call to Arms. Charles E. Gannon on new Caine Riordan series entry Raising Caine, and much more. Missed past episodes? No problem. We’ve got every episode archived for your listening pleasure. Last month we asked you for your best original military SF inspired joke. Your entries left us rolling in the aisles, but in the end, we had to pick one to be this month’s winner. Congrats to John J. Maroney. He wins a copy of the new anthology Future Wars and other Punchlines, signed by editor Hank Davis. Read his winning joke below. Q: What do you call a robot soldier that can’t fight? David Drake is a master—of military SF, of space opera, and of fantasy. Now, top writers pay tribute to Drake with all-new stories set in the worlds he created. 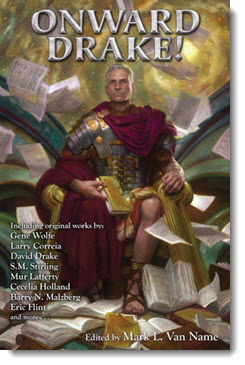 Includes new fiction from Eric Flint, Gene Wolfe, Larry Correia, and many more. Plus, a new Hammer’s Slammers story from the master himself. Don't forget to check out the newest ebook releases here, plus read “Not for Ourselves Alone,” a new novella in the Caine Riordan universe by Charles E. Gannon here. And don’t miss Jim Beall’s new non-fiction essay “Case Studies in Handwavium” here. For upcoming appearances by Baen authors and editors, check here.